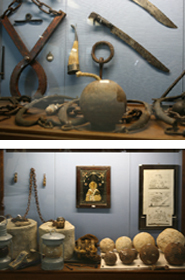 Equipment for the pressing of olives and making of wine as well as workshops from the blacksmith, the tanner, the barber, the baker, the cooper, the carpenter and the farmer are on display in the basement. Basically, the visitor gets an idea of how life on Alonissos was before the terrible earthquake of 1965 tore down most of the buildings of old town. 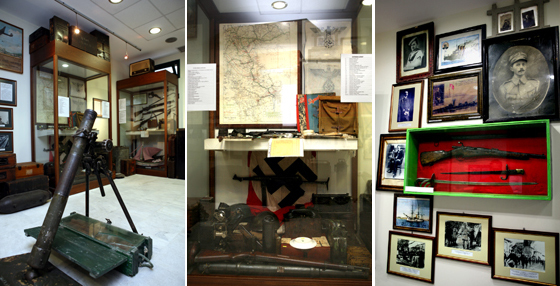 The first floor above the reception area houses the conference room, the pirate artefact area and the room with memorabilia of the National Resistance from each of the wars since 1821. This room specially tributes all those young Alonissos men who lost their lives in battles on the mainland and at the Albanian border. From the earliest times the Aegean has known the activities and horrors of piracy. Ancient Greek Mythology and ancient authors too, often mention pirates and their operations. Apart from pirate attacks on ships there were also pirate raids on coastal towns, which is why the Greek coasts of the Aegean are full of ruined castles and towers built by the locals for their protection. Over the years the people of the Aegean gradually began to arm their ships and to learn to repel pirate attacks. One might say that with all the experience the Aegeans had acquired from living for years under the incessant threat of piratical attacks, the Greek islanders and sailors succeeded in making history by their brilliant achievements in the War of Independence of 1821. 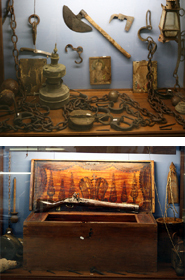 In the Pirate Artefact room of the Museum, with authentic pirate treasures, you'll find a unique, educational and entertaining collection of weapons and objects used in the early days by and against the pirates of the Aegean Sea. In this way sea-robbers come alive in the Alonissos Museum. On the floor of the entry hall an exhibition of old camera's and accessories is on show. The exhibition covers a wide range of items from early cameras, box camera's, minitiature camera's, modern 35mm SLR, rangefinder and medium format equipment through to a couple of early digital camera's. Accessories like films, flash guns, filters, tripods, dark room equipment etc. are displayed too. The prime goal of this collection is to present and preserve an example of a broad range of cameras and to give a visitor an entertaining and rewarding trip to the world of the photography before bits and bytes. Here we like to show a part of the information on the development of photography as shown in the vitrines of the exhibition.